Sarasota, ideally situated mid-way on Florida's Gulf Coast, is an idyllic beachfront community! From its cool turquoise waters, to the white sands of its beaches, to the brilliant pinks of its bougainvillea in bloom, Sarasota is always ablaze in color. But Sarasota's natural beauty is only the beginning. Sarasota is also Florida's cultural capital - home to the state art museum - the John and Mable Ringling Museum of Art, a variety of theaters, galleries, a ballet, opera, symphony and more. Both Longboat Key and Sarasota offer world-class dining, shopping and nightlife, including St. Armands Circle, with its fabulous boutiques. For the sports-minded, public golf and tennis courts abound, as well as professional baseball during spring training, the Sarasota Kennel Club, boating and fishing. The city of Tampa, only an hour away by car, offers its own attractions including Busch Gardens, the Tampa Bay Bucaneers and more, while a world of fun awaits you in nearby Orlando, including Walt Disney World, Sea World, Epcot Center and more. Best view in the resort collection! Crystal sand and shimmering Gulf waters make Veranda Beach Club your timeshare destination. Annual week 49! Enjoy the beautiful keys of Florida! Price is negotiable. 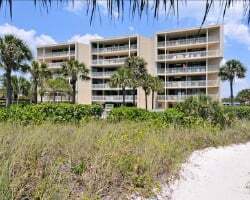 Located on the beautiful sandy beaches on an island near Sarasota! Annual week 35! Buyer may receive a title fee credit, inquire for details! Beautiful resort on an island with white sandy beaches and many onsite activities! Annual week 36! Inquire for details!